Close to Richland Center is this 21+/- acre parcel. Mostly wooded but some scattered open pasture area for plenty of campsites, picnic and future building site potential. Good hunting with convenience to town. Property has frontage along County Highway Q and owners may provide access off Christian Lane (a dead end town road) if ridge top access is required. 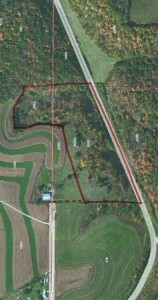 Property acreage to be determined by survey by seller prior to closing. Offer can be made based on a price per acre.